Army Staff Sgt. Derrick Brooks (L) stands in for President Elect Barack Obama and Navy Yeoman 1st. 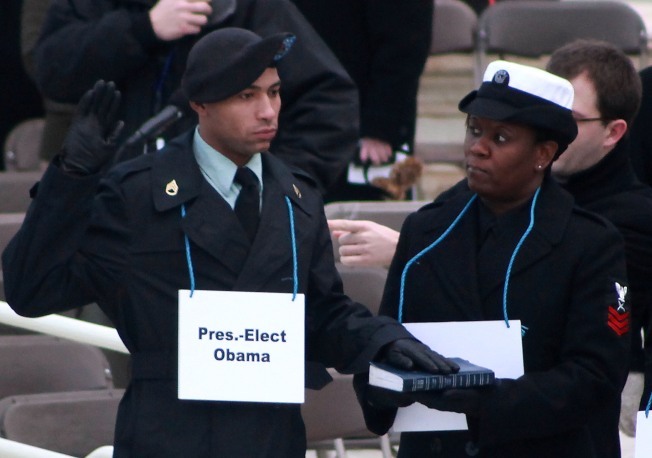 Class LaSean McCray stands in for his wife Michelle Obama during a dress rehearsal of the swearing of the new president, in front of the U.S. Capitol Building January 11, 2009 in Washington DC. Barack Obama will be sworn in as the Nation's 44th president on January 20, 2009. Derrick Brooks puts his left hand on the book and raises his right, ready to take the oath of office. Dozens of cameras capture this moment in history, even though Brooks is wearing a name card reading "Pres.-elect Obama." "It felt great to be famous for one day," Brooks told reporters after spending hours standing in for Barack Obama during Sunday's dress rehearsal for the presidential inaugural Jan. 20. Organizers picked the 26-year-old Army staff sergeant from Fayetteville, N.C., because he resembles Obama in height, weight and skin color. But he's not an exact match. When Brooks met Obama last Thursday, "he said my ears weren't as big as his." Admitted to the exclusive club of stand-ins were military personnel from the area who resembled Obama's wife, Michelle, Vice President-elect Joe Biden and others expected on the inaugural stage. Even a faux President George W. Bush showed up as inaugural officials worked out the kinks in their plans for what likely will be the biggest ceremony the nation's capital has ever hosted. The 6-foot 2-inch Brooks stood stock still as several handlers moved the man facing him, a stand-in for Chief Justice John Roberts, to the right -- then left, then right again, before marking the spot with brightly colored tape. Small shifts and fixes were all part of a long day. "It's important to rehearse this so it goes off flawlessly on the inauguration day," said Navy Chief Petty Officer Lucy Quinn, spokeswoman for the Armed Forces Inaugural Committee. "The president is supposed to take the oath of office as close to noon as can possibly be timed." When the president-elect's name was announced during the practice inauguration, it was "Barack H. Obama" -- not Barack Hussein Obama. During the campaign, Obama's middle name -- common in the Middle East -- was at times used as a negative by people opposed to his election. Wearing a grin even wider than Obama's, Brooks told reporters he was honored to participate in the dry run. "I know it's a change in history," he said, "and it's a historical moment that only happens, that's only going to happen, one time."